Wimbledon is, at least in part, a paint-by-the-numbers romance, but its cast serves up a fine affair. And tennis has never been more exciting. 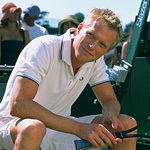 Peter Colt (Paul Bettany, A Beautiful Mind) is facing his last professional tennis tournament. Ranked 119 out of 4 million tennis players, he’s good enough to have stumbled back into Wimbledon as a wild card. Fettered by an unsupportive family (even his brother bets against him) and the aches and pains of a 30-something, he’s looking forward to it all coming to an end. Although he’s played Wimbledon before, he’s never won a match there. He’s also never won a match with his family in attendance. The tennis gods have decided to smile upon lowly Peter, though. His first stroke of luck is to be erroneously given keys to the hotel room registered to Lizzie Bradbury (Kirsten Dunst, Spider-Man 2). It just so happens she’s a rising star, America’s answer to the spate of young female Russian sexpots taking the tennis courts by storm. And Peter stumbles into her mega-swanky suite right at the moment she enters the shower. Talk about a lucky man. Their unlikely meeting is indeed ever so unlikely. To top it off, as fate, and every other romantic comedy, would dictate, she’s just the spark Peter needs to reignite his fire. It’s a shame her father (Sam Neill, Jurassic Park) is such a wet blanket. This tennis dad is determined to see his little girl make it to the top. That means no scoring off the court. After all, in tennis, love means zero. Wimbledon is a cinematic mixed double. It harbors all the elements of the breezy romantic tale and it also packs the competitive vibe of the underdog sports saga. Under Richard Loncraine’s (Richard III) steady direction, the balance works nicely. He also has the benefit of a well-crafted screenplay that gives the engaging supporting characters room to shine. Hitting the humorous notes just right, Bernard Hill turns in his crown from The Lord of the Rings and takes on the role of Peter’s father. On the outs with his wife, he moves into the backyard tree house, complete with TV and antenna to capture all the Wimbledon action. Theirs is one take on love, the love of a couple that has become too familiar with each other. At the other end of the spectrum, even Peter’s goofball brother finds love with a girl whose hobby is chat rooms (broadband, no less). But for Peter, his is a love for the ages. Bucking the sports superstition that pre-game hanky-panky is a bad thing, he takes the passion from the boudoir to the tennis court and surprises his opponents as he mounts the mother of all comebacks. Not all is strawberries and cream at this Wimbledon, though. Dunst is good as a young romantic interest, particularly with that web-slinger Peter Parker, but she’s hard to believe as a tennis powerhouse. There are also some appropriate cameos by tennis legends that fall flat as they serve up loads of tennis gobbledy-gook and try to heighten, unnecessarily so, the drama unfolding on the tennis courts. Even so, Austin Nichols (The Day After Tomorrow) is effectively unlikable as the egotistical, smarmy, empty-headed American tennis pro, Jake Hammond. As for Bettany, he’s becoming one of the most bankable actors around, at least in terms of turning in a solid performance. He turns Peter into an underdog worth cheering for and, foiled perfectly against the upstart Nichols, Wimbledon’s final rounds of tennis become a nail-biting foray into sports iconography. Images from The Natural and Rocky come to mind. In the end, it’s all about regaining the eye of the tiger and reaffirming the unmistakable power of love. As clichéd as all this might sound, Wimbledon is fresh enough and agile enough to avoid feeling like a cliché parade.